Kaalia Dialogues - Get famous, hit dialogues from Kaalia movie. This is an action film which was released in 1981, written and directed by Tinnu Anand, and produced by Iqbal Singh. Amitabh Bachchan (in the title role), Parveen Babi, Asha Parekh, Kader Khan, Pran, Amjad Khan, K.N. Singh and Jagdeep played the main lead role. The music is given by R.D. Burman. The movie was also remade in Kannada in 1984 as Huliyaada Kaala starring Tiger Prabhakar and in Tamil in 1987 as Cooliekkaran. 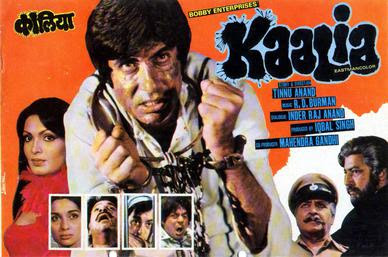 The film was another classic from Bachchan's angry young man. Kaalia was a major success at the Box Office. The film is also remembered for having the iconic dialogues "Hum Jahan Khade Ho Jaate Hain Line...Wahin Se Suru Hoti hai" delivered by Amitabh Bachchan. The film 'Kaalia' is full of awesome dialogues, some are really amazing and stunning. Here we have collected all hit and famous dialogues from Kaalia Movie. "Apne dushman ko maarna hai toh usse ussi ke hathyaar se maaroo"